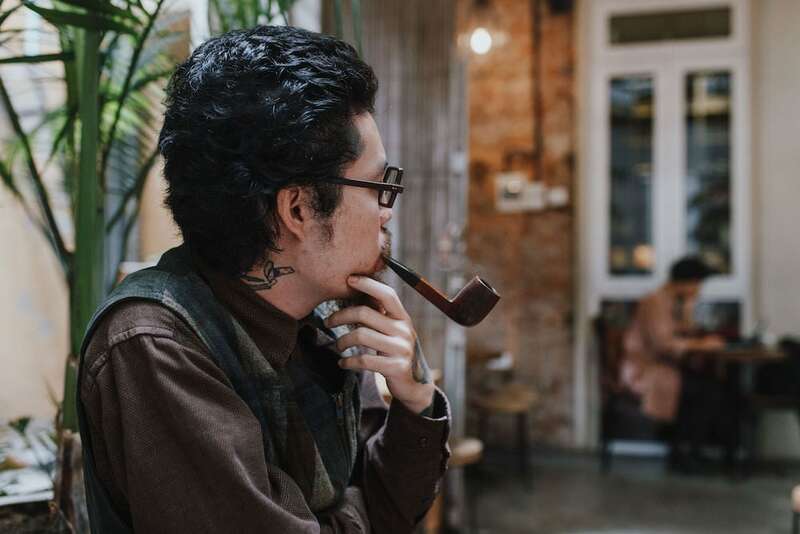 Poet, photographer and co-founder of Hanoi’s Tranquil cafes, Nguyen Hoang Nam is passionate about everything to do with Hanoi, from the people to the smells and the colours. 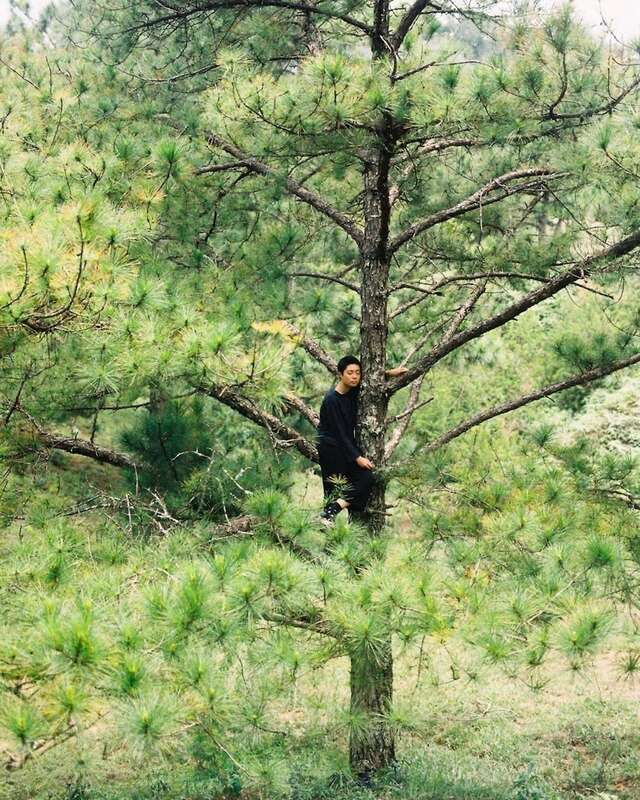 Known to most by his pen name Nam Lu, his life philosophy is to stay simple and honest. 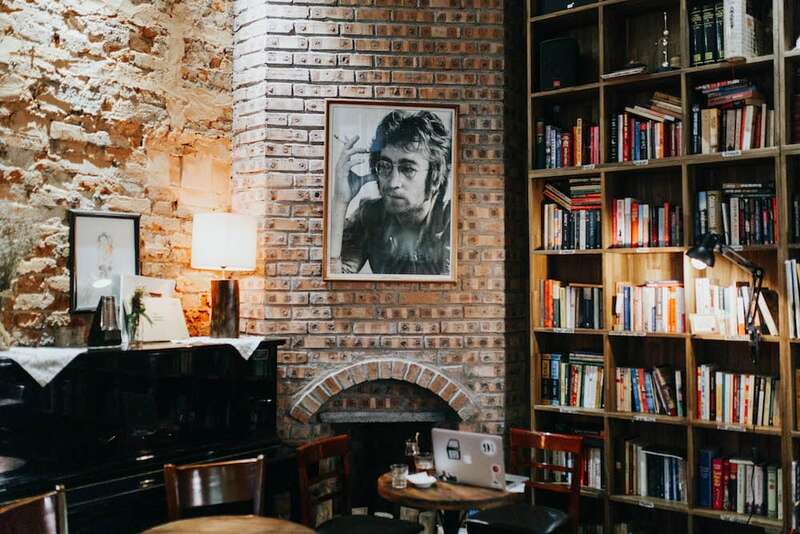 Tranquil Books & Coffee at 5 Nguyen Quang Bich—one of four cafes in the group—is very much that; a relaxed space to gather, read a book or just enjoy a brew. The decor is simple yet cosy and there are strict rules about keeping your volume down to ensure that everyone can enjoy the space. Lu started writing poetry at nine years old and was writing regularly by the time he started high school. It’s a love that stems from his passion for the Vietnamese language and playing with words. 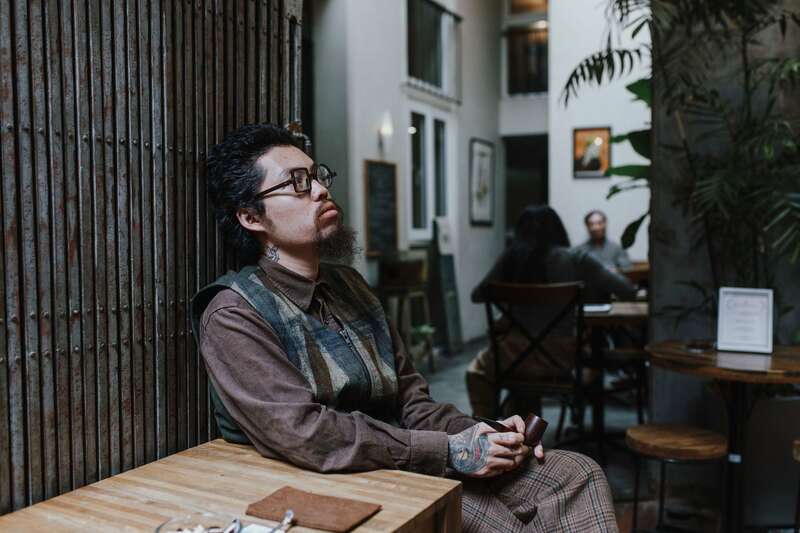 His poems are mostly shared on his personal Tumblr but to date he has published two poetry collections; “Lấp kín một lặng im” in 2015 and “Sự đã rồi anh ngồi anh hát” in 2017. 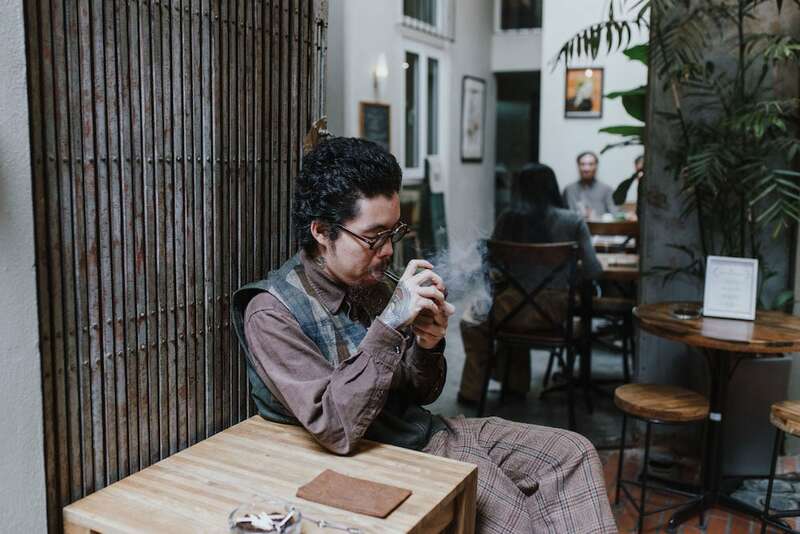 Nam Lu is a poet, photographer, and co-founder of Hanoi’s Tranquil cafes. 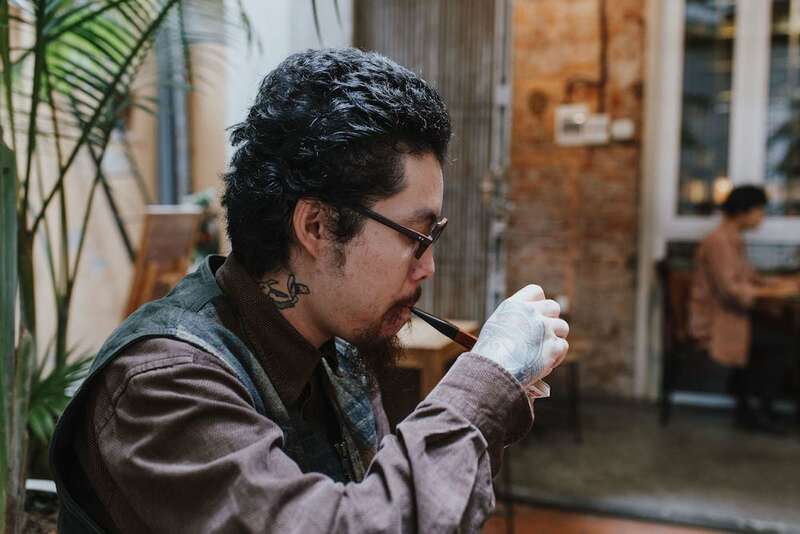 With his beard, quirky clothing, and pipe in hand, Lu says his style is guided by impulse. Similarly, his writing is just as loose and carefree, and despite many of his readers looking for the message behind his words, there isn’t any deep meaning, according to Lu. 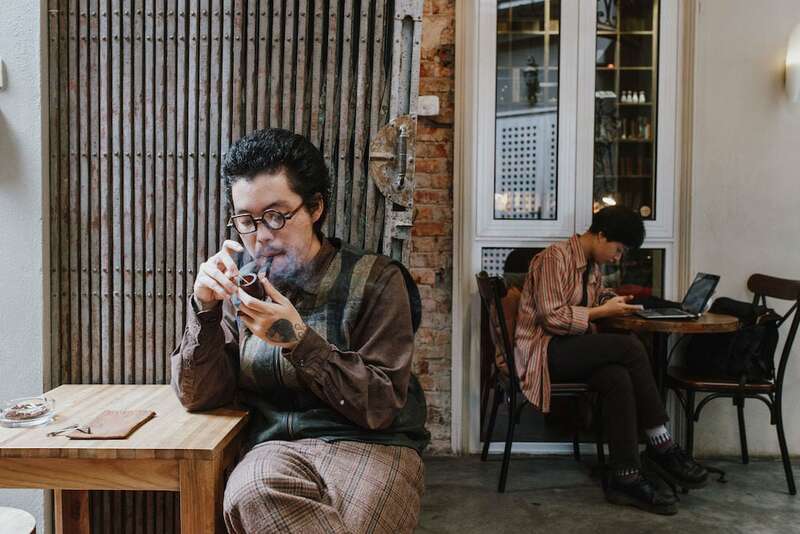 In the beautiful, serene courtyard of 5 Nguyen Quang Bich, Vietcetera caught up with Lu for a coffee and a chat about his writing, where he finds inspiration…and why we should not take him too seriously. 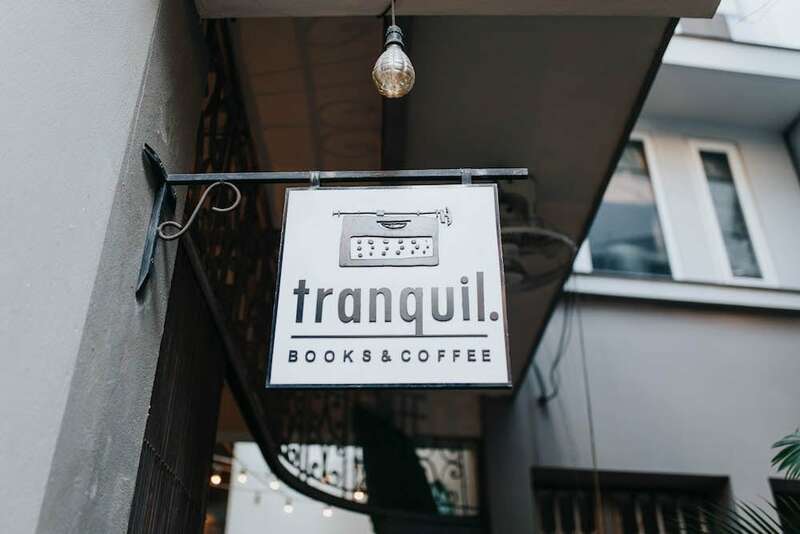 Tranquil is a relaxed space to gather, read a book or just enjoy a brew. When did you start writing and what was it that attracted you to poetry? I love the Vietnamese language. Writing prose and poetry comes to me as naturally as most other things in my life—without any plan or intention. I especially love poetry because it is a world where I can play with words while being as honest and simple as possible. I started to write when I was nine or ten years old. My first piece was a really long and funny poem about the things around me; my friends, my family, our pets and the other things in my life at the time. I cannot recall much of it now. I started to write regularly by the time I started high school at the age of 16. It makes me laugh when i reread the stuff I wrote back then. I’m sure many years later when I look back on my current work it will also make me laugh. Nam Lu in the serene courtyard of the original Tranquil at 5 Nguyen Quang Bich. My inspiration comes from everything around me—mostly the things that I feel attached to. I cannot force myself to sit down and write. I let it come to me naturally. Sometimes it might be when I’m out, while I’m eating, or when I meet my friends, or even out of nothing, just when my emotions strike me. There are times when I cannot write anything for many months and times when I cannot stop writing for an entire day. I never force it. I always write for myself and myself only. I mostly write about my thoughts, my friends and my memories, and sometimes about love and about Hanoi. I grew up in Hanoi. There’s something very special and unique about Hanoi. Saigon has a very positive energy but it’s too big for me. I like Hanoi for its smells and its colours. It’s also home to my beloved people. I’m passionate about politics but I don’t write about the topic. 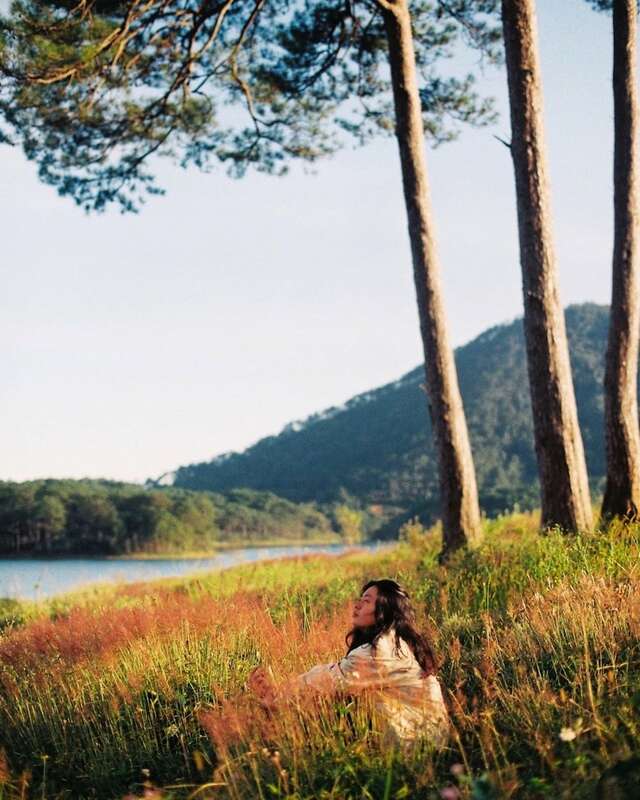 There are many poets and people out there writing beautiful pieces about politics, hoping to change the world, change society, change the political landscape in Vietnam. But I’m different. I think the most practical and personal thing I can do is to create something nice to help my people and the people who I love. It’s a small but meaningful act. What sort of feedback do you commonly receive from your readers? My readers and I have different backgrounds but we share the same attitudes and memories of the people and city we live in. My readers often tell me that they find themselves in my writing. They seek empathy and they find it in my work. Others look at my work and try to find the message behind it. But there is no message. I’d advise them not to take me too seriously, I’m full of nonsense. Is there a poet or poem that particularly inspires you? Trần Dần is someone who particularly inspires me, mostly due to the invisible energy of his poetry. It’s tender yet powerful. You refer to yourself as the “black sheep” of your family. What do you mean by this? My whole family are accountants. My father, my mother, my brother, and my sister-in-law all work for the same company. But despite our differences, they always support me. They’re happy because they see that I’m living my life and it makes me content. My mother has been the most supportive person in my life. When I was younger I’d try to cover up my tattoos so she wouldn’t find out. However, one night I came home drunk and went into her room to get some clean clothes. I thought she was sleeping but she walked up behind me and saw the tattoo on my back. She started crying and yelling. I said nothing and went back to my room. The next morning, she called me downstairs and I saw that she had invited all of our neighbors to our house. She had called them over to admire my tattoo. When I got my next tattoo, she even helped me care for it. You are also a very talented photographer. What do you enjoy capturing when you’re behind the lens? Just like my writing, I like taking photos of things related to me. These are some glimpses of the beauty and happiness that I want to keep. These memories never die. “These memories never die,” Nam Lu says about his photographs. You also have a very unique sense of style. How would you define it? I try not to build an image for myself. I grow my hair and my beard, I smoke my pipe and people often ask why I have chosen this style. The truth is I didn’t choose this style. It’s just what I feel like wearing and doing. I consciously don’t follow fashions, or try to conform to a community, or try to stand out. A lot of people read my writing and build an image about me. I often tell my friends, many people know Lu but not so many people know Nam. Sometimes I really like someone because of their work, I prefer to keep a distance and admire them from afar. We often build up a perfect image of someone we admire and refuse to accept their flaws. The truth is we’re all human and we all have flaws. Together with your friend Tuan Anh, you opened the first Tranquil Cafe in 2015. What was your vision behind this café and what makes it different? I wanted Tranquil to be somewhere defined by its characteristics, vibe, and people. The people are the most important part of the space. Tranquil is a gathering place for the people I love and care about—my partners, my staff, and my customers. It is and will always be something very personal to me. Tranquil is a place where you can spend the day doing anything you want in a cosy and intimate environment. I think every coffee shop in Hanoi has their own unique strong points. As for Tranquil, it lives up to its name, and that is enough. Tranquil’s decor is simple but cosy with strict rules about keeping your volume down to ensure that everyone can enjoy the space. Tell us a bit about Tranquil Book Club. What books are you reading? Tranquil Book Club is a long-term project where I hope to draw people in to talk about books, write book reviews, or just to listen to other people talk about the books and the authors they like. The hard thing about growing a club is maintaining the quality of the meetings and the content. We are trying our best to set up a stable, sustainable plan for it. Currently, I’m reading Raymond Carver and Milan Kundera—two of my most beloved authors. I come back to them every time I think my life is lacking something. One of your latest ventures is Longer Than a Summer. Can you tell us a bit about this bar and when it’s expected to open? Longer than a Summer will be a speakeasy—a hidden bar and private club—where we will meet our friends and loved ones every night, play our favourite music, and smoke our pipes. It won’t be open to strangers and from the outside it will look just like any other house. There will be no sign, no doorbell and no advertisements. It is about creating a very intimate world of our own. We hope to have it ready before Christmas, but you won’t know about it as there won’t be a grand opening. Finally, what advice would you give writers and poets who are starting out? My advice to them is to be honest and simple, nothing else.